One of the things I really enjoy doing is putting unit studies together. 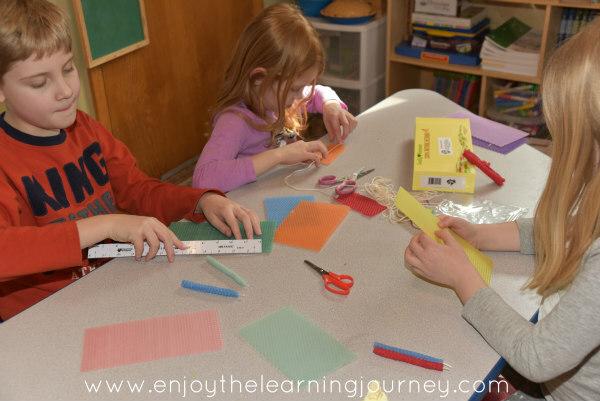 I love finding books to include and fun activities that everyone will enjoy. And I like finding ways to include notebooking too (I’m still working on getting the hang of this, as to how best to include this for each child, but have made progress this year). Out of everything, reading good quality books together is the best of all. Since the Five in a Row (FIAR) curriculum has wonderful book selections, I enjoy using this curriculum as a springboard. I do not go in order as laid out in the manual but select our book based on interests, season, or what else we are studying. Since I have the Five in a Row Starter Kit which includes the first three volumes and the Bible supplement it is easy to do it this way. I pick and choose from the learning and activity suggestions in the manual as well as add my own. The kids have really enjoyed some of the units and still talk about our experience with them. Last month, as we were approaching the middle of February, I felt eager to get back into our FIAR studies. We had taken a break from it for Christmas and were working on a African Safari unit in January, which was wonderful, but we had taken a month to work through that unit and were ready for our next adventure. I was unsure which unit to do next and sat down to take a look at the manual and finally decided on The Bee Tree. 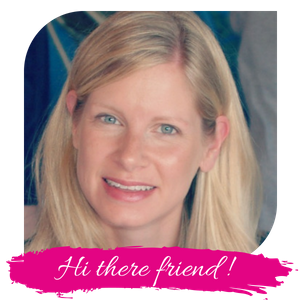 The next day as I was searching for ideas and learning opportunities when a honeycomb showed up at my house! Here’s the Instagram post from when it happened. 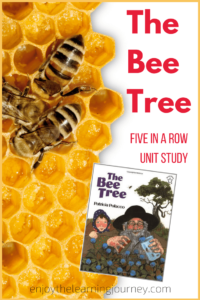 There is a crazy story behind this honeycomb that I just have to share with you…….Yesterday I decided that The Bee Tree would be our next Five in a Row unit study or "row". We took a break from FIAR before Christmas and I really want to get back into it. So, I had been looking online to order the book and for a couple of ideas. 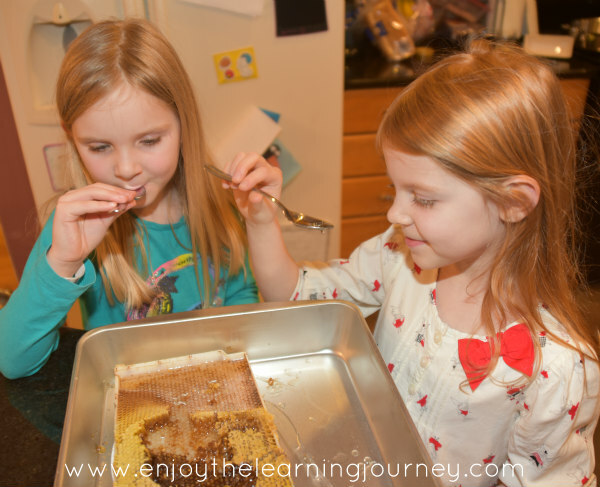 I decided it would be neat for the kids to see a real honeycomb and did some searches. Then I saw a text come through from my husband with pictures of this big honeycomb with the caption "this is at work". I was so confused because he works in an office. Did he somehow know that I was searching for honeycombs and send me a picture of one?! I wasn't sure what he meant or what was going on so I asked him about it. It turns out that a beekeeper he knows brought this in to his office yesterday. The beekeeper had collected a huge swarm of bees outside their office last summer and he brought some honey in to share. Yesterday. At the same exact time I was searching for honeycombs online. So weird. But awesome. And Joey was able to bring this home so we could look at it and try the honey. And it is the sweetest honey I've ever tasted! What a perfect lead into The Bee Tree for next week! What an exciting start to our unit! We all tried the honey which was truly the sweetest honey I’ve ever tasted. And we looked closely at the honeycomb and used a magnifying glass to look at all the details of the bee (there were several dead bees on the honeycomb). We went to our local zoo a few days later since we had some unseasonably warm February days in Wisconsin. And we passed a little bee hut there. The bees weren’t in there yet but we got to read some fun facts about bees. A couple of days later the book arrived (thanks to Amazon’s super quick shipping!) and we began digging in! 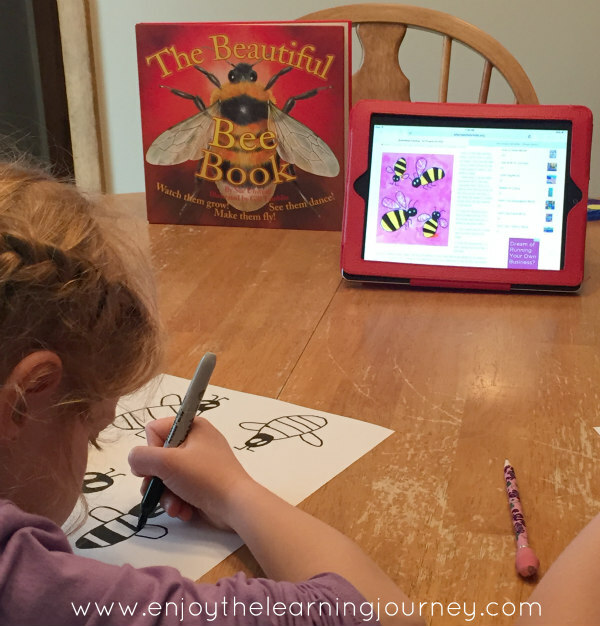 We read The Beautiful Bee Book as a supplement to learn more about bees and this was a perfect selection. I’d highly recommend it. Typically I include a bunch of additional books to supplement our Five in a Row unit study but this time I decided to keep it to a minimum and see how that might enrich our study. Because I have found that sometimes, when I include too many additional books it waters it down. It becomes overwhelming as we try to read all the additional books and we lose sight of the main book that the unit is supposed to be focused on. Honestly, while I really enjoy finding and including lots of books, I found this approach so much more manageable. Plus, it allowed the kids to really become familiar with and enjoy the two books we focused on. During the week, the kids completed an art project. 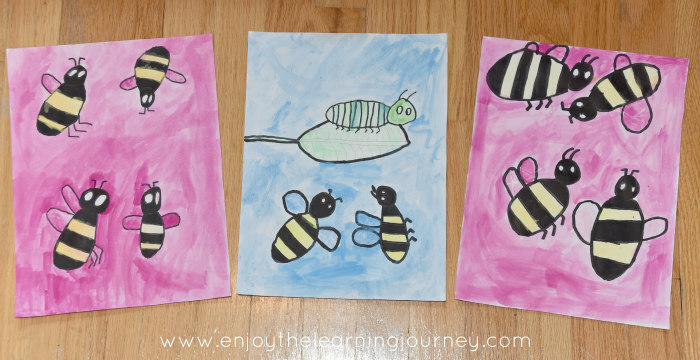 I found this Bee painting on Art Projects for Kids (I love the ideas on this site and while she does have some paid projects, many are free). All three of my children (ages 6 and 9) really enjoyed this art project and I love how they turned out. 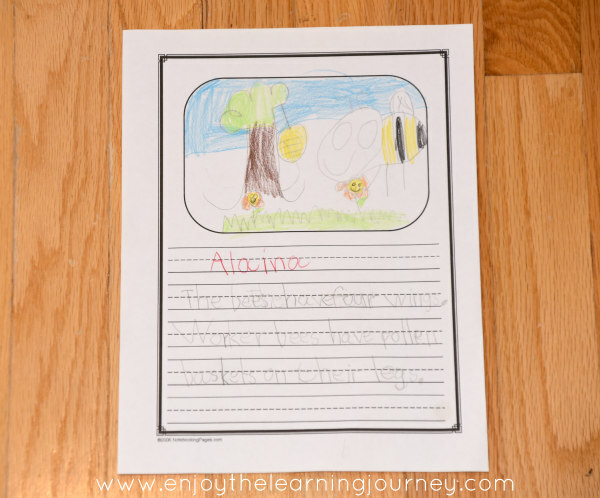 I printed out some notebooking pages from NotebookingPages.com (I have the lifetime membership) and the kids wrote facts about bees that they learned. 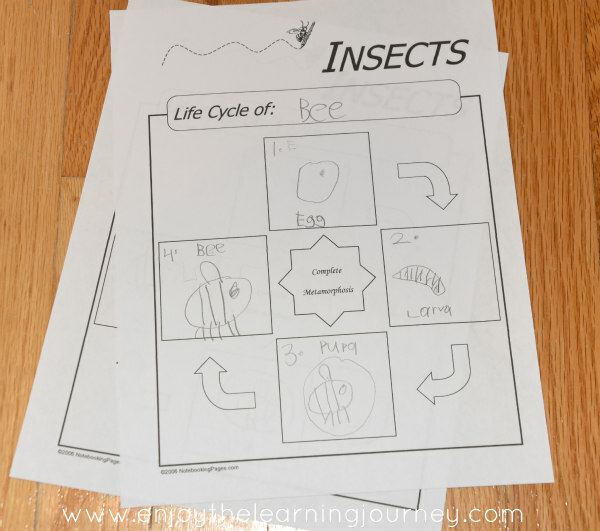 I also used a NoteboookingPages.com page so the kids could show what they learned about the life cycle of a bee. 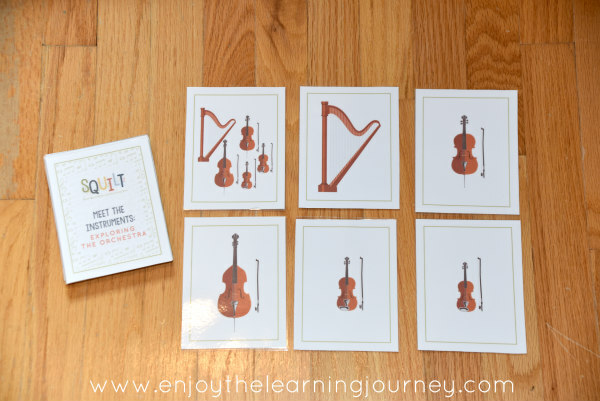 We also talked about the stringed instruments (as characters in the book are playing them) and used printable flashcards that I had purchased from SQUILT Music. The reason this was included in the study was because there are characters in The Bee Tree who are playing stringed instruments. In addition to all these activities, we had discussions, talked about things outlined in the manual and filled in some maps which I did not get photos of. Overall, it was a very rich and memorable unit study. 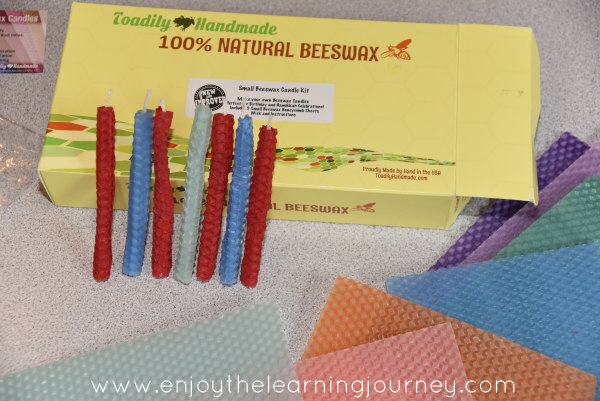 And one of our most favorite parts of this study was making beeswax candles. I received a beeswax candle kit as a Christmas gift and was excited for this opportunity to make candles with my kids. The bright colors are so pretty and the kit makes it really easy to make the candles. 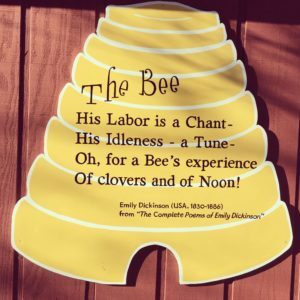 If you are looking for ideas for The Bee Tree or a bee unit study, I’d encourage you to visit a bee farm if you are able. This would allow your children to get an up-close look at bees, hives and taste some honey. (Because I realize most of you won’t have a honeycomb fall into your lap like I did. This type of thing doesn’t usually happen to us, really! I think it was God’s reminder to me to stop stressing and trust Him). To see if you have any bee farms close to you just do a quick Google search. After doing a search of my own, I realized we have one really close to us that I’d like to take my own kids to this summer! Happy learning! Have a wonderful study!